The Kehlsteinhaus and the nearby town of Berchtesgaden are both located in the region known as the Berchtesgadener Land, located deep in the south-eastern corner of the Free State of Bavaria (Freistaat Bayern). On a map, the Berchtesgadener Land (often referred to as the “BGL” or Dreieck) looks rather like a small triangle or arrowhead extending southwards into Austria, nestled up against the Berchtesgaden Alps (Berchtesgadener Alpen) to the south and east. 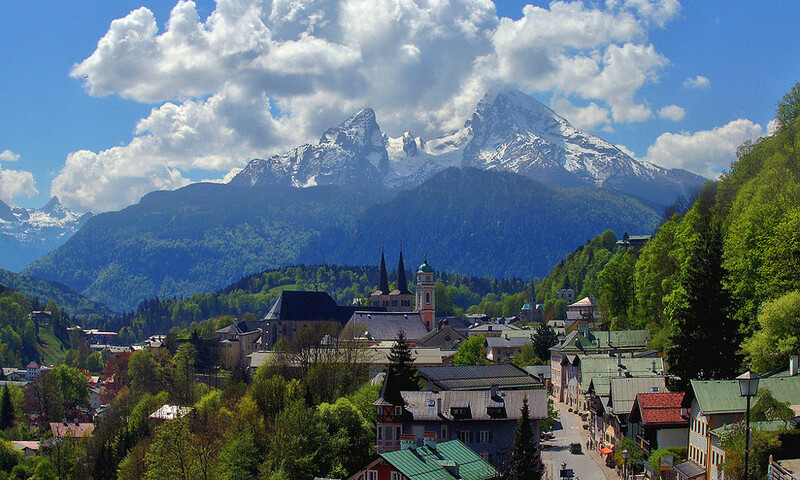 The largest towns in the BGL are the regional capital of Bad Reichenhall – a spa town famous for its salt production – and Berchtesgaden, the closest major settlement to the Kehlstein mountain. Tucked away almost completely inside an Austrian enclave, Berchtesgaden is some twenty-five kilometres south of the historic Austrian city of Salzburg and some 180 kilometres south-east of the Bavarian capital of Munich (München). To the south of the town of Berchtesgaden lies the Berchtesgaden National Park (Nationalpark Berchtesgaden) a region of natural beauty that has since 1990 been designated as an UNESCO Biosphere Reserve. The region is noted for the plethora of local flora and fauna, from hardy alpine plants through to the famous alpine marmot (Murmeltier) and the golden eagle or Steinadler, often seen as the symbol of the region. Founded in August 1978, the Berchtesgaden National Park covers an area of 210 square kilometres. Located just on the edge of the Berchtesgaden National Park to the north-east is the Kehlstein mountain, one of five neighbouring peaks in the region – the Hoher Göll, Hohes Brett, Jenner and the highest point completely within German territory at a height of 2713 metres, the middle peak of the spectacular Watzmann massif. Did You Know?The Kehlsteinhaus is located at a height of 1834m above sea level, and on a clear day you can see the Austrian city of Salzburg, some 25km away. The somewhat remote position of the Berchtesgadener Land means that the closest German settlement with a population of over fifty-thousand people is the city of Rosenheim, which is just under a hundred kilometres away to the west; the region’s natural hinterland is the Salzburgerland in Austrian territory, with Salzburg less than half an hour’s drive away. Indeed, many who choose to visit the region would usually arrive at Salzburg’s compact Flughafen W. A. Mozart. Being less than twenty-five kilometres by road from Salzburg and one hundred and fifty kilometres – less than a three hour drive – from Munich, it is more than feasible to visit the Kehlsteinhaus as part of a day trip. Before planning your journey however, it should be noted that the Kehlsteinhaus itself is only open to the public during the summer months, specifically, from May through to October. NoticeThe road to the Kehlsteinhaus is always closed between October and May, on account of it being impassable. While the house is also closed to visitors, it is indeed possible to journey to the peak by foot - though this is not recommended during winter months. Please note that these are basic guidelines and that the latest visitor information should be obtained from the official www.eagles-nest.de website (German language only).